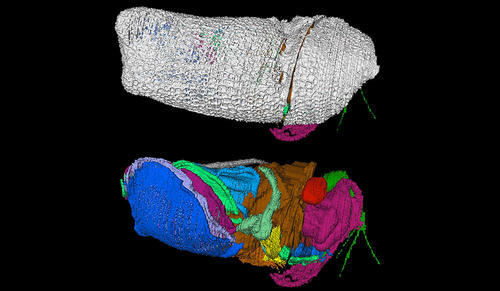 A new animal species related to crabs and shrimp, preserved in 430-million-year-old rocks in Herefordshire, England, presents a rare look at the respiratory organs of a tiny crustacean. A team of scientists from Yale, the University of Leicester, Oxford, and Imperial College London announced the discovery Nov. 7 in a study in the Royal Society journal Biology Letters. The new species is named Spiricopia aurita, from the Latin words for “breath of life,” “abundance,” and “ears,” referring to the preservation of gills and the shape of the carapace. Yale paleontologist Derek Briggs, a co-author of the study, said the exceptionally well-preserved fossil, which is less than 10 mm long, revealed not only the animal’s hard shell but also its limbs, eyes, gut, and gills. Briggs said the animal’s respiratory system included five pairs of gills with canals that conveyed essential fluids — implying that a heart evolved in representatives of ostracods, this common group of micro-crustaceans, more than 430 million years ago. The first author of the study is David Siveter of the University of Leicester.